Porcelain veneers are capable of making dramatic changes in your smile by correcting cracked, chipped, misaligned, gapped, and discolored teeth. They are thin facades of dental porcelain that are bonded to the front of your natural teeth. If you want to use veneers to correct any mis-alignment, chip or cracked teeth you may more than one veneer and it’s important to color match them with you existing teeth. It’s recommended that you have you teeth whitened before getting porcelain veneers so they can be matched to the whitest shade of you natural teeth. 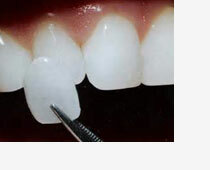 To prepare your teeth for porcelain veneers, it’s necessary to remove a small amount of you natural enamel. This allows the porcelain veneers to become the new surface of your teeth, smoothly flush with you natural tooth root, with no ledges or gaps that can trap food particles and harbor bacteria. Typically, the process is painless, but we use local anesthesia to ensure you experience a minimum of discomfort and dental sedation is available if you are anxious. Once you teeth are prepared, impressions are taken and sent , along with notes about you cosmetic goals, to the dental lab where high quality porcelain veneers will be custom made. The porcelain veneers are permanently bonded to your teeth and you can begin enjoying their great-looking and long-lasting results. We will give you care instructions and if you follow these care instructions you veneers are likely to last more than a decade.